Italy is a diverse country that boasts miles of Mediterranean coastline, scenic lakes such as Lake Garda, snow-capped Alps and the sun drenched regions of Umbria and Tuscany. The country is home to a variety of native plants, many of which are used as seasonings across the globe. There are numerous flowers native to Italy that can be grown in the home garden. Silver thyme (Thymus citriodorus) is a garden hybrid that stems from common thyme (Thymus vulgaris) native of Southern Italy. Silver thyme is an herb that boasts small lilac flowers, which appear at the end of silvery green leaves. Reaching a height of about 6 inches to a foot, silver thyme has a mounding habit and a lemony scent that can be incorporated into a traditional herb or butterfly garden. The early summer flowering plant can be cultivated in USDA Hardiness Zones 4 to 9. Like most herbs, silver thyme requires full sunlight to thrive. A well-drained soil that's kept mostly dry is perfect for this plant, which requires very little water. A member of the figwort family, the common snapdragon (Antirrhinum majus) is a flowering short-lived perennial that hails from Italy, as well as North Africa. The plant reaches a variety of heights depending on the cultivar, from 4 inches to several feet. 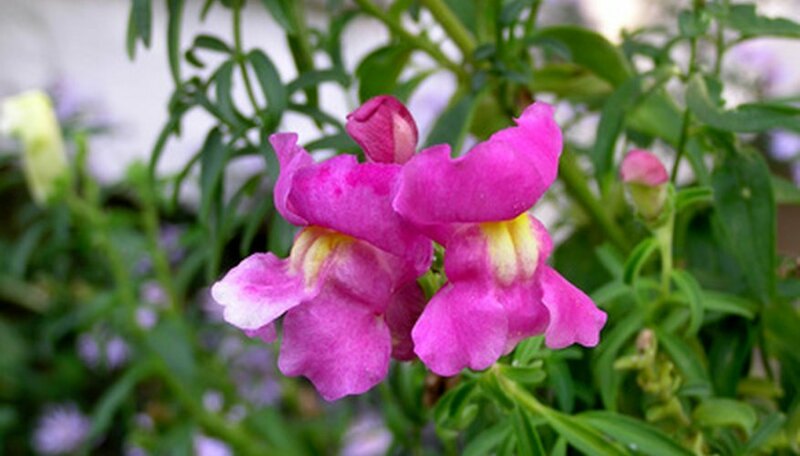 The common snapdragon offers columns of soft, silky blooms in a range of pastel colors, from pale lemon yellow to pink or lilac. Snapdragons are especially popular with children, as squeezing the flowers gently causes them to suddenly "snap" open. The common snapdragon is best suited to USDA Hardiness Zones 4 to 11, preferably in full sunlight. A rich, well-draining soil is ideal for the snapdragon, and the plant should be watered frequently until established. Big periwinkle (Vinca major) is a flowering herbaceous member of the dogbane family native to Italy and France. Rarely growing above a foot high, big periwinkle is a sprawling plant that offers a garden dull green leaves and lavender or "true blue" flowers. The plant is popular as a low-growing ground cover, or as a graceful hanging basket plant. Big periwinkle does best in full sun or partial shade in USDA zones 7 to 9. The plant should be cultivated in a fertile, loose woodsy soil for best results. Though big periwinkle will make do with dry soils, a soil that's moist to the touch is preferable.